Should women with infertility just relax? Will avoiding stress increase chances of conception? A study just published online in the British Medical Journal (BMJ) concludes there is no association between high emotional stress and failure of fertility treatment. So does this mean women can stop enrolling in yoga, meditation and mindfulness workshops? In today’s blog I’ll try to sort out the mixed messages of recent research on stress and infertility treatment. The impact of stress on conception has been under debate for a number of years. In the 60’s women were often advised to “just relax,” or to “take a second honeymoon,” which felt infuriating, especially when it moved the responsibility from the physician to the woman. Furthermore, since about half of infertility is due to a male factor, women resented being targeted as needing to monitor their stress levels. Ultimately, as physicians were able more clearly to diagnose physiological causes for a couple’s infertility, the “relax” advice diminished and assisted reproductive technologies claimed increasing credit for success rates in conception. So, even as folk wisdom may have promoted stress as a cause of infertility, physicians tended to agree that stress, when it was present, was most likely to be an effect of infertility. So how much stress are we talking about? In the BMJ article, 30 percent of couples in their studies stopped treatment because of the psychological burden. Research also exists citing that the stress levels of infertile women are equivalent to women with cancer, AIDS, or heart disease. 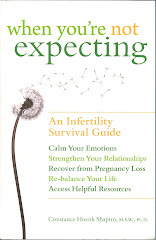 So there is no question stress is present in women receiving infertility treatment. But does it contribute to the failure of infertility treatment? In one of my earlier blogs, I mention that Dr. Alice Domar has conducted research with women who are receiving treatment for female factor infertility. As an adjunct to these women’s medical treatments, Dr. Domar has offered mind-body programs and has conducted research that shows participants in such programs can have significantly higher pregnancy rates than women who receive medical treatment only. So why would Dr. Domar’s research demonstrate that specific workshops in mind-body relaxation increase chances of conceiving, whereas the BMJ research claims that emotional stress is not associated with failed infertility treatment? Part of the answer may lie in the numbers and in participant diversity. Dr. Domar’s participants, numbering in the hundreds, were enrolled in Massachusetts workshops conducted by her and her staff. The BMJ research reviewed 14 prospective studies from 10 countries covering 3,583 women who underwent a cycle of infertility treatments. So we can presume more diversity in the BMJ international sample than the Domar Massachusetts sample. What we do not know in any of the studies is how many male partners were diagnosed with factors contributing to the couples’ infertility. But, most significant, is how one measures stress. Dr. Domar’s participants self-defined themselves as wanting to reduce their stress while being treated for their infertility; the BMJ studies considered only those participants who rated emotional distress before treatment. In both cases, subjective self-ratings were used, without any awareness of the physiological presence of stress hormones in the bodies of the participants. In contrast, an August 2010 article in the journal Fertility and Sterility cited pregnancy results from participants whose stress hormones were measured using saliva samples. The findings in that study actually demonstrated that although the stress hormone cortisol had no adverse effect on conception, women with high concentrations of another stress hormone, alpha-amylase, were 12 percent less likely to become pregnant each month than those with the lowest levels. What that teaches us is that not all stress hormones have an effect on fertility and, most important, self-report measures of perceived stress do not enable researchers to measure with any accuracy the physiological presence of stress hormones that affect conception. So where does that leave us? Hopefully with a healthy respect for the stress caused by infertility; perhaps with a careful eye for how a study defines stress, and ideally with an awareness that consistent collection of physiological measures of stress is more informative than self reports, which cannot easily be standardized. But we also are left with the awareness that many women would do anything to be rid of the stress that accompanies their infertility. So, whether or not stress can be credibly shown to be associated with fertility failure, women being treated for infertility should be offered every opportunity, with their partners, to participate in mind-body workshops and other forms of learned relaxation that can diminish their stress. Infertility is hard enough as we give up parts of our lives to infertility specialists. But we can rejoice (okay, okay, we can be thankful!) that stress management is something we can do for ourselves -- to feel better, to connect with our partner, and to learn skills that will build a strong foundation for facing future life challenges, whatever they may be.